Do you have alignment/pulling problems? Do you have steering system problems? Do you have suspension/front end knocking problems? Do you have rear suspension knocking problems? Do you have improper tire wear patterns? Do you have brake rotor warping problems? Do your brakes make the car pull to one side? Do you have “SRS/AIRBAG” light problems? Do you have engine stalling problems? If so, you may have a vehicle that qualifies for coverage under California’s Lemon Law. You could receive your money back or a new replacement vehicle! 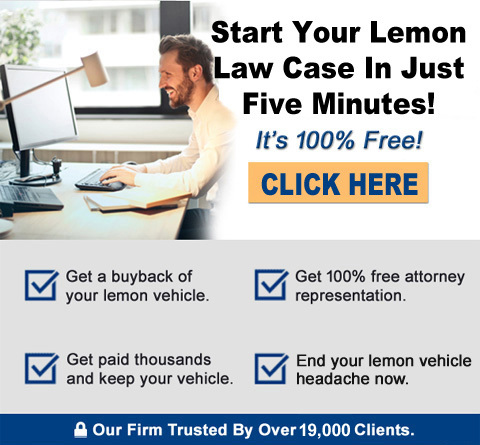 If you feel that you meet the “4 or more repair attempts” criteria noted above, please call us at the toll-free number below to receive a FREE Lemon Law case review and evaluation of your vehicle. Cases that are accepted will be at NO COST to the consumer (attorney’s fees paid by auto manufacturer).